Powers/Abilities: As a trained SHIELD agent, she is a good combatant and good with the use of weapons. She had knowledge of gamma radiation and its effects. During her brief time as Ms. MODOK, Kate had access to a wide variety of mental powers as well, reminiscent of the original MODOK. History: At some point, Kate Waynesboro, agent of SHIELD, was assigned to spy on Bruce Banner AKA the Hulk. Despite the fact Banner controlled the Hulk at the time, SHIELD wanted to ensure it stayed that way, and the savage Hulk would not return. (Incredible Hulk II#287) - Bruce Banner met his new research assistant, Katherine Waynesboro. She was shocked when Bruce changed into the Hulk in front of her to show her what it was like. Bruce showed Kate all of his research and the Recordasphere, which got jealous because Bruce was paying so much attention to Kate. Later the Recordasphere spied on Kate as she sent a message back to SHIELD saying she had infiltrated the Northwind Observatory and gained Bruce's trust successfully. (Incredible Hulk II#288) - Kate picked up Bruce after a dentist appointment. The dentist was actually another SHIELD agent, whom Kate shared information with before leaving. On the ride back to the observatory, Bruce and Kate talked until Kate began to apparently come on to Bruce. The Recordasphere, which had heard Kate's conversation with the dentist, became incredibly jealous and sabotaged the car that Bruce and Kate were in. The car crashed, but Bruce, as Hulk, rescued Kate. She thanked him with a kiss. (Incredible Hulk II#289) - Recordasphere confronted Kate and told her that it knew she was a SHIELD spy. The Recordasphere then armed itself with a laser and pointed it at Kate. Before the Recordasphere could fire however, the Abomination (who had been sent by MODOK) busted in and destroyed it. Kate then took out an "ion-disrupter" and shot at the Abomination. Bruce ran onto the scene and was startled to see Kate holding the weapon. Kate admitted that it was SHIELD issue and that she was an agent. Bruce was naturally distraught, but fought and defeated the Abomination nonetheless. Kate tried to talk Bruce afterward, but the Abomination quickly grabbed Kate and escaped before Bruce could do anything about it. (Incredible Hulk II#290) - The Abomination went to MODOK's hideout only to find that AIM had driven his employer out. The Abomination offered AIM his help. Recognizing Kate as a SHIELD agent, the scientists, who knew MODOK would be back eventually, decided to create a new MODOK out of Kate. Bruce, as the Hulk, and MODOK both attacked AIM, but by then, Kate had turned into Ms. MODOK. Instead of fighting for AIM, however, she joined with Bruce and MODOK and defeated AIM. Afterward, she did not listen to reason, as the procedure had warped her mind. She said she wished to be the bride of MODOK, until she witnessed MODOK's callous disregard for life, at which point she no longer wanted him. She attacked MODOK, who fought back, eventually driving her back on to AIM's alteration platform. MODOK soon fled from the power of the Hulk, who found Kate changed her back into normal. The Hulk picked Kate up, reasoning that MODOK had deliberately driven her back onto the platform to restore her humanity. He also hypothesized that Kate--as Ms. Modok--had struck a chord in MODOK that he had never known was there: mercy. (BTS) - Kate quit SHIELD to be with Bruce. (Incredible Hulk II#292) - Bruce and Kate met a scientist at a Mexican university who has been using the gammascope to increase food production. Later, Bruce talked with Kate that perhaps things were going too fast (both with the gamma research, and with their relationship). The next morning, Bruce and Kate saw that the irradiated crops were burned (by the Dragon Man). Later, Kate was present during Hulk's fight with the Circus of Crime, and assisted him by helping him escape the Ringmaster's control. (Incredible Hulk II#293) - Bruce and Kate got back to New York, and at the Airport, Kate was present while a man tried to shoot Bruce in retaliation for when Hulk had destroyed his town a while back. Kate and Bruce went to the Baxter Building to use some of Reed Richard's equipment. When it exploded, Kate was shielded by the explosion by Bruce, who turned into Hulk just in time. Over dinner, they talked about the Hulk, and how Bruce decided that he wanted to spend his life making amends for his misdeeds as the Hulk. (Incredible Hulk II#294) - After helping Bruce in an experiment in which he cured a sick dog with gamma radiation, Kate was kidnapped by Boomerang, under order of Max Stryker. Max had her kidnapped so he could use her as a hostage and force Bruce to try to cure his cancer with gamma radiation. Unwillingly Bruce subjected him to the experimental treatment. (Incredible Hulk II#295) - After being delayed for a week during the Secret Wars, Hulk came back and rescued Kate, but nearly reverted into his savage persona in the process. They went back to the Observatory, where they discovered that Stryker had been using the experimental gamma treatment on a large number of sick people. Kate watched as Hulk seemed to act more savagely and worried he might revert to his savage persona. (Incredible Hulk II#296) - Stryker turned into a Hulk-like monster and fought with Hulk while Kate went to help ailing people who were having bad side-effects from the gamma treatment. Kate watched as Hulk fully reverted to his savage persona, and was emotionally crushed by it. Rom showed up and Kate filled him in. He drained the radiation out of Stryker and the other people who had received the gamma treatment, but could not do it for the Hulk, whose DNA had long been changed by the radiation. During the fight that ensued between Hulk and Rom, Kate ran over to tried and help, but the Hulk just knocked her aside. Bruce regained control very briefly and was very upset at what he had done, but then reverted again and leaped away as Kate wept. (Incredible Hulk II#297) - Kate agreed to help SHIELD stop the Hulk, who was on a rampage, but was shocked to hear they would kill him if they needed to. (Incredible Hulk II#298) - Kate, who was back working for SHIELD along with other agents, tracked down Hulk. The Hulk defeated all the agents, but when he grabbed Kate, Bruce Banner managed to take control again for a few seconds. He told Kate to run. Bruce then reverted back into his savage form, hit Kate and left. (Incredible Hulk II#299) - Kate worked again with all the other SHIELD agents in trying to halt the rampaging Hulk. SHIELD tried everything, but the Hulk defeated the SHIELD agents again. Kate tried again to help Bruce regain control, but it was no use, as the Hulk just pushed her aside. During the confrontation she realized that Bruce would rather be dead than be the savage Hulk. (Incredible Hulk II#300) - While SHIELD made another attempt at stopping the Hulk, Kate decided she couldn't be a part of this anymore and turned around and left. (Incredible Hulk III#100/2 - BTS) - Kate Waynesboro apparently became Gabe Jones' girlfriend and is still with him (alternatively, they could just be co-workers and Amadeus Cho was just joking about her being his girlfriend). Comments: Created by Bill Mantlo and Sal Buscema. A very sad story. Bruce Banner always comes so close to being truly happy, but never manages to attain it. Jarella being killed by Crypto-Man, Betty dying at the hand of Abomination, Kate leaving a mindless Hulk behind with Bruce trapped somewhere deep within, it has become a constant in the Marvel Universe. Big thanks to The Incredible Hulk: Engine of Destruction for the image. According to Marvel Year-in-Review '92, Ms. Modok was seen on a date with the Spot at a Bar with No Name in Springdale, CT (hometown of Speedball). The two had probably met on a blind date, since Ms. Modok couldn't even remember the Spot's name. 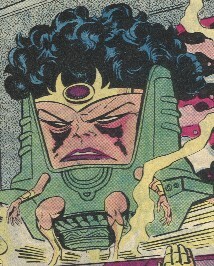 Ms. Modok listened in some bewilderment as the Spot claimed to have been "Spider-Man's greatest adversary in years." With the rest of the Bar crowd, the couple listened to the standup act of the second Jester; the evening ended when the Scourge of the Underworld emerged from a clock that had formerly been the robot Tomazooma and began shooting up the place. Ms. Modok and the Spot departed along with most of the crowd, with apparently no fatalities. Kate Waynesboro has a profile in World War Hulk: The Gamma Files. PROFILE BY STUNNER, minor updating (Comments) by Luis Dantas. (Ms. MODOK) Incredible Hulk II#290, p13.